p = anova1(y) returns the p-value for a balanced one-way ANOVA. It also displays the standard ANOVA table (tbl) and a box plot of the columns of y. anova1 tests the hypothesis that the samples in y are drawn from populations with the same mean against the alternative hypothesis that the population means are not all the same. p = anova1(y,group) returns the p-value for a balanced one-way ANOVA by group. It also displays the standard ANOVA table and a box-plot of the observations of y by group. 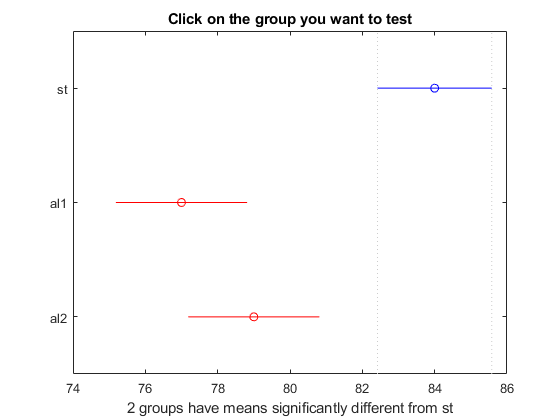 p = anova1(y,group,displayopt) enables the ANOVA table and box plot displays when displayopt is 'on' (default) and suppresses the displays when displayopt is 'off'. [p,tbl] = anova1(___) returns the ANOVA table (including column and row labels) in the cell array tbl. To copy a text version of the ANOVA table to the clipboard, select Edit > Copy Text. [p,tbl,stats] = anova1(___) returns a structure, stats, which you can use to perform a multiple comparison test. A multiple comparison test enables you to determine which pairs of group means are significantly different. To perform this test, use multcompare, providing the stats structure as an input argument. Create sample data matrix y with columns that are constants, plus random normal disturbances with mean 0 and standard deviation 1. The ANOVA table shows the between-groups variation (Columns) and within-groups variation (Error). SS is the sum of squares, and df is the degrees of freedom. The total degrees of freedom is total number of observations minus one, which is 25 - 1 = 24. The between-groups degrees of freedom is number of groups minus one, which is 5 - 1 = 4. The within-groups degrees of freedom is total degrees of freedom minus the between groups degrees of freedom, which is 24 - 4 = 20. MS is the mean squared error, which is SS/df for each source of variation. The F-statistic is the ratio of the mean squared errors (13.4309/2.2204). The p-value is the probability that the test statistic can take a value greater than the value of the computed test statistic, i.e., P(F > 6.05). The small p-value of 0.0023 indicates that differences between column means are significant. The data are from a study of the strength of structural beams in Hogg (1987). The vector strength measures deflections of beams in thousandths of an inch under 3000 pounds of force. The vector alloy identifies each beam as steel ('st'), alloy 1 ('al1'), or alloy 2 ('al2'). Although alloy is sorted in this example, grouping variables do not need to be sorted. Test the null hypothesis that the steel beams are equal in strength to the beams made of the two more expensive alloys. Turn the figure display off and return the ANOVA results in a cell array. The total degrees of freedom is total number of observations minus one, which is 20-1=19. The between-groups degrees of freedom is number of groups minus one, which is 3-1=2. The within-groups degrees of freedom is total degrees of freedom minus the between groups degrees of freedom, which is 19-2=17. MS is the mean squared error, which is SS/df for each source of variation. The F-statistic is the ratio of the mean squared errors. The p-value is the probability that the test statistic can take a value greater than or equal to the value of the test statistic. The p-value of 1.5264e-04 suggests rejection of the null hypothesis. You can retrieve the values in the ANOVA table by indexing into the cell array. Save the F-statistic value and the p-value in the new variables Fstat and pvalue. The data are from a study of the strength of structural beams in Hogg (1987). The vector strength measures deflections of beams in thousandths of an inch under 3000 pounds of force. The vector alloy identifies each beam as steel (st), alloy 1 (al1), or alloy 2 (al2). Although alloy is sorted in this example, grouping variables do not need to be sorted. Perform one-way ANOVA using anova1. Return the structure stats, which contains the statistics multcompare needs for performing Multiple Comparisons. The small p-value of 0.0002 suggests that the strength of the beams is not the same. Perform a multiple comparison of the mean strength of the beams. Display the comparison results with the corresponding group names. The first two columns show the pair of groups that are compared. The fourth column shows the difference between the estimated group means. The third and fifth columns show the lower and upper limits for the 95% confidence intervals of the true difference of means. The sixth column shows the p-value for a hypothesis that the true difference of means for the corresponding groups is equal to zero. The first two rows show that both comparisons involving the first group (steel) have confidence intervals that do not include zero. Because the corresponding p-values (1.6831e-04 and 0.0040, respectively) are small, those differences are significant. The third row shows that the differences in strength between the two alloys is not significant. A 95% confidence interval for the difference is [-5.6,1.6], so you cannot reject the hypothesis that the true difference is zero. The corresponding p-value of 0.3560 in the sixth column confirms this result. In the figure, the blue bar represents the comparison interval for mean material strength for steel. The red bars represent the comparison intervals for the mean material strength for alloy 1 and alloy 2. Neither of the red bars overlap with the blue bar, which indicates that the mean material strength for steel is significantly different from that of alloy 1 and alloy 2. To confirm the significant difference by clicking the bars that represent alloy 1 and 2. Sample data, specified as a vector or a matrix. 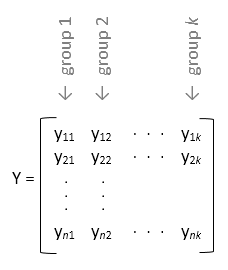 If y is a vector, you must specify the group input argument. group must be a categorical variable, numeric vector, logical vector, character array, string array, or cell array of character vectors, with one name for each element of y. The anova1 function treats the y values corresponding to the same value of group as part of the same group. Use this design when groups have different numbers of elements (unbalanced ANOVA). If y is a matrix and you do not specify group, anova1 treats each column of y as a separate group. In this design, the function evaluates whether the population means of the columns are equal. Use this design when each group has the same number of elements (balanced ANOVA). If y is a matrix and you specify group, then group must be a character array, string array, or cell array of character vectors, with one name for each column of y. The anova1 function treats the columns that have the same group name as part of the same group. If group contains empty or NaN-valued elements, anova1 disregards the corresponding observations in y.
Grouping variable, specified as a numeric or logical vector, character array, string array, or cell array of character vectors, containing group names. If y is a vector, group must be a categorical variable, numeric vector, logical vector, character array, string array, or cell array of character vectors, with one name for each element of y. The anova1 function treats the y values corresponding to the same value of group as part of the same group. 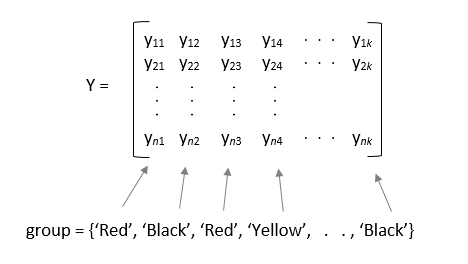 If y is a matrix, then group must be a character array, string array, or cell array of character vectors, with one group name for each column of y. The anova1 function treats the columns of y that have the same group name as part of the same group. If you do not want to specify group names, enter an empty array () or omit this argument. If group contains empty or NaN-valued elements, the corresponding observations in y are disregarded. For more information on grouping variables, see Grouping Variables. For example, if y is a vector, with observations categorized into groups 1, 2, and 3, then you can specify the grouping variables as follows. For example, if y is a matrix, with six columns categorized into groups red, white, and black, then you can specify the grouping variables as follows. Indicator to display ANOVA table and box plot, specified as 'on' or 'off'. When displayopt is 'off', anova1 returns the output arguments, only. It does not display the standard ANOVA table and box-plot of the columns of y.
p-value for the F-test, returned as a scalar value. p-value is the probability that the F-statistic can take a value larger than the computed test-statistic value. anova1 tests the null hypothesis that all group means are equal to each other against the alternative hypothesis that at least one group mean is different from the others. The function derives the p-value from the cdf of the F-distribution. Ap-value that is smaller than the significance level indicates that at least one of the sample means is significantly different from the others. Common significance levels are 0.05 or 0.01. ANOVA table, returned as a cell array. tbl has six columns. source The source of the variability. SS The sum of squares due to each source. MS The mean squares for each source, which is the ratio SS/df. F F-statistic, which is the ratio of the mean squares. Prob>F The p-value, which is the probability that the F-statistic can take a value larger than the computed test-statistic value. anova1 derives this probability from the cdf of F-distribution. The rows of the ANOVA table show the variability in the data that is divided by the source. Statistics for multiple comparison tests, returned as a structure. stats has six fields. anova1 returns box plots of the observations in y, by group. 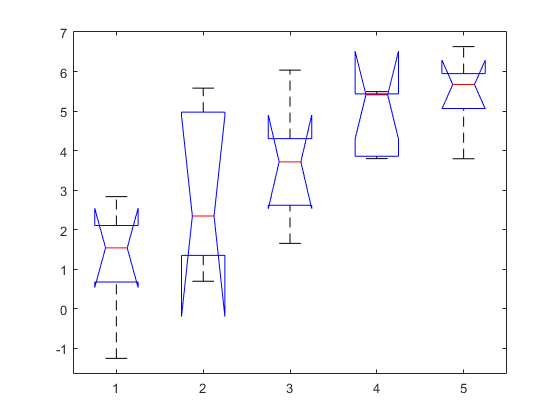 Box plots provide a visual comparison of the group location parameters. If y is a vector, then the plot shows one box for each value of group. If y is a matrix and you do not specify group, then the plot shows one box for each column of y. On each box, the central mark is the median and the edges of the box are the 25th and 75th percentiles (1st and 3rd quantiles). The whiskers extend to the most extreme data points that are not considered outliers. 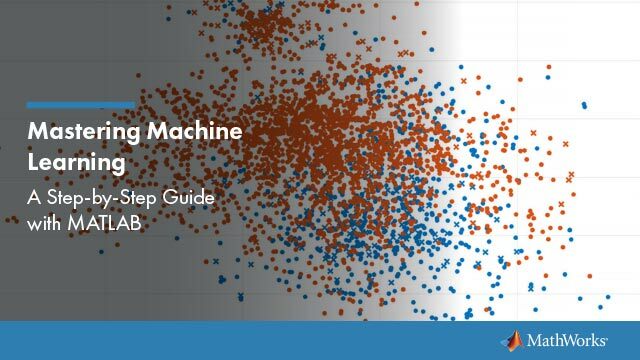 The outliers are plotted individually. The interval endpoints are the extremes of the notches. The extremes correspond to q2 – 1.57(q3 – q1)/sqrt(n) and q2 + 1.57(q3 – q1)/sqrt(n), where q2 is the median (50th percentile), q1 and q3 are the 25th and 75th percentiles, respectively, and n is the number of observations without any NaN values. Two medians are significantly different at the 5% significance level if their intervals do not overlap. This test is different from the F-test that ANOVA performs, but large differences in the center lines of the boxes correspond to large F-statistic values and correspondingly small p-values. 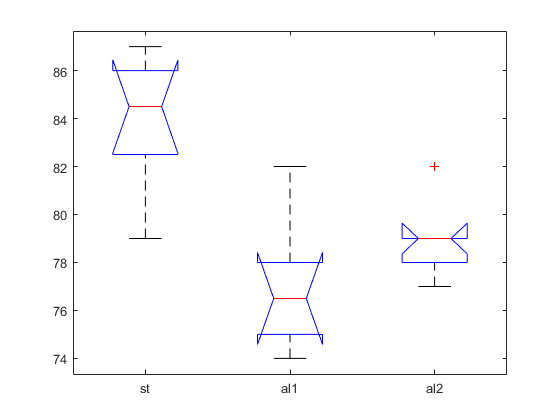 For more information about box plots, see boxplot. Hogg, R. V., and J. Ledolter. Engineering Statistics. New York: MacMillan, 1987.